Save an extra CDN$ 22.00 (47%). Buy the Kindle Edition instead. Comment: Solid copy with some shelf wear and/or markings scattered throughout. Keep it Canadian! Sold by The-number-one-store and ships from Amazon Fulfillment. Start reading Seveneves: A Novel on your Kindle in under a minute. Neal Stephenson Speaks about His Latest Epic: "Seveneves"
David Mitchell, author of Cloud Atlas and the forthcoming Slade House, recently interviewed Neal Stephenson about Seveneves, Stephenson’s breathtaking new book about the survival of the human race, which Amazon picked as one of the Best Books of the Month. DM: Good morning, afternoon or evening, Neal. NS: Hello, David! Thank you for your work with stammering. I did it for a few years when I was a kid, and then it mysteriously stopped—no idea why. Maybe something to do with being left-handed. DM: Thank you. Firstly, congratulations on your audacious, multidisciplinary Seveneves—I binge-read its 800 pages over a single weekend, and hugely enjoyed it. Secondly, thanks for this opportunity to quiz you directly: I’m a big admirer of The Baroque Cycle. NS: Thank you. Some part of me always feels as though writing The Baroque Cycle or something like it is what I really ought to be doing and that everything else is some inexplicable digression. DM: Please ignore any questions that are wrongheaded or too geeky or feel like a chore to answer. NS: “Too geeky” is inconceivable. DM: Given that Seveneves is both a singular creation as well as belonging proudly to the apocalypse/space ark/survivor subgenre of SF, I’d like to begin by asking which books your novel shares literary DNA with? Novels that occurred to me as I read (please confirm/shoot these down as appropriate) are: for impending global wipeout, H. G. Wells’ In the Days of the Comet; for cannibalism in space, a story by John Wyndham in The Seeds of Time; for a Great Chain-style orbital environment, Joe Haldeman’s Worlds. You’re clearly a much “grittier” (meant as a compliment), more twenty-first century stylist than both Asimov and Philip José Farmer, but I also wondered if the Foundation cycle of the former and the Riverworld books of latter informed the endowment your “manufactured civilization” with historical and political depth. Finally, does the spirit of William Gibson’s Neuromancer walk your Great Chain and New Earth? Not so much as regards plot or theme: rather, its reveling in an eclectic magpie multiculturalism and a certain hard-boiled humor. Finally finally, did you ever look at the Old Testament to remind yourself what happened to Noah’s descendants post-Flood? And what are any major absences in my list? NS: This question requires more introspection than is my normal habit, but I’ll have a go. 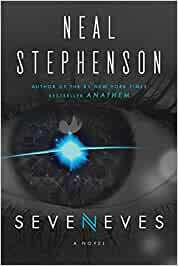 I have read many of the books mentioned, but the most influential book, as far as Seveneves is concerned, is one whose name and title I have unfortunately forgotten. When I was a boy I used to ride my bike to the Bookmobile, a library on wheels that parked in a certain location the same day very week, and check out whatever they had in the way of science fiction. This would have been in the late 1960s or early 1970s. I have a clear memory of reading a book with a picture of a large, Golden Age of Science Fiction–style rocket ship on the cover, about an impending planetary disaster that forced the people of Earth to build a space ark and fly off into safety. As you point out, there have been enough such books to be definable as a subgenre, but for some reason this one grabbed me and made a deep impression. Too bad I’ve forgotten what it was called. At about the same time there was a popular song in a similar vein, about people getting on a space ark to escape some kind of environmental collapse. Again I have forgotten its title and can’t seem to dig it up on the Internet, but we have all heard it. I can hear the tune in my head right now. Anyway, at that point in my life—some time when I was around ten or twelve years old, probably—the notion got into my head that what you’re calling the apocalypse/space ark/survivor subgenre was interesting and that it would be fun to write one of those someday. Of course, by the time I finally got around to doing it, four decades later, much had changed in the world of SF and so it was clear that I was going to have to adopt a less naive approach, which might explain why you are seeing resonances of William Gibson et al. As for the Old Testament, no, I didn’t go back and look at it specifically. Perhaps that is because I felt I already knew the story in my bones, and perhaps it was out of an unconscious reluctance to be overly influenced by it. You don’t want your readers seeing easy connections; it becomes a distraction. Even those of us who haven’t read it for a while have a general awareness that the Noah’s Ark story occurs very early in the Bible and this it’s only a setup for the world that unfolds from it. DM: Seveneves suggests you've thought deeply about the “Whence Personality?” question. NS: I’m honestly not sure where to draw the line between “thought deeply about...” and “thought a serviceable plot device could be made out of…” but I appreciate your giving me the benefit of the doubt. DM: In the “Five Thousand Years Later” part of Seveneves, your characters are defined by their genetic heritage. The influence of culture is acknowledged, but culture seems to be a mega-amplification of the genetically derived personalities of its dominant populace. NS: That’s not wrong, but I’d argue it is also a more conscious, self-aware assertion of ethnic and cultural identity based on the Epic. By the time we get to “Five Thousand Years Later,” it’s impossible for most people to disentangle genetic from cultural factors. Which, come to think of it, might sound familiar. DM: My question, then: What about life experience? Might not a Julian, for example, experience events that prepare her for an act of Christ-sized self-sacrifice? In our own lives, to what degree do you think personal experiences can trigger an epigenetic shift of the self? NS: Just as an informal, nonscientific observation, most people’s personalities don’t seem to change very much during their lives. There are exceptions in the case of people who go through hugely traumatic events or suffer from brain injury or disease. Some would argue that religious conversions can have deep personality-altering effects. But these are all exceptions to the rule. Having a persistent nature is part of being human. Otherwise we wouldn’t be able to speak of knowing another person, or loving them, or being their friend or enemy or rival. Part of being a sentient human is the ability to anticipate others’ mental states—to say “Fred’s going to hate this but Jane would love it." If you’re still with me, the only thing that can effect a big change in personality is something that physically rewires the brain and/or alters the body’s chemical milieu. Your example is interesting, though, because is it hinted at and prefigured in the book, right? The Julians are carrying a curse on their backs because of what their Eve did and so part of their cultural program is to say, in effect, “No, look, those same personality traits can be used for good.” Professionally, they gravitate towards spiritual professions. So the scenario you describe is totally plausible, and would in fact make for an interesting piece of ancillary fiction set in this world. DM: Your novel is dyed with the theme of survival: of survival’s fragile and random nature; of individual survival, of cultural survival, of genetic survival. Do you think there’s a connection between the survival instinct and a hunger for immortality? And speaking of immortality, do you believe in the soul? NS: I actually don’t think that there is a connection between the survival instinct and a hunger for immortality. A species has to become pretty intellectually advanced in order to grasp the concept of death in the abstract, and to dream up the idea of immortality. Long before that (in evolutionary terms) all species with brains have the survival instinct in some form. So, I am just saying that there are many existent proofs of species that have one, but not the other. Last year I experienced a virtual reality demo at Valve. In real life it took place in a room in an office building. I was wearing a VR headset that was showing me an environment where I was standing on a high platform with a long drop off the edge. I knew intellectually that I could walk around the room and be perfectly safe, but it was difficult to take that step off the platform because my visual system was warning me of danger. [Regarding] the soul, I’m a little wary of any discourse on that topic that pretends to have an answer, so I tend to keep my musings to myself. There is interesting, legitimate metaphysical work on the topic going at least as far back as Leibniz and continuing today, following the theme that consciousness, or at least computation, might be at least as fundamental as phenomena such as space, time, energy, and matter, which are the usual subject matter of physics. I follow that sort of thing with interest but with very modest expectations that answers will be arrived at during my lifetime. DM: Did any part of Seveneves present itself to you in a dream, a nightmare or a fever? NS: Does it seem that way? I would love to be the sort of writer who could garner usable ideas that way, but it happens rarely, and not in the case of this book. DM: Your whittling down of 7 billion people to seven Eves adds up to a traumatic (if gripping) read: first the Event itself, then an “Epic” of good intentions foiled, bad luck, wrong decisions, Julian machinations, cannibalism, short-termism, violence and Might Is Right; all pretty dystopian. But then “Five Thousand Years Later,” apart from the Red and Blue Schism, is pretty utopian: the human population is stable, terraforming is working well, people live long, useful lives, and a fair degree of social justice seems to prevail. NS: Interrupting you for a second, I suspect it’s only utopian in the way that modern life in Oxford or Pacific Heights is utopian; we are only seeing the good stuff in this book, because we spend very little time in the Habitat Ring, and that among busy, educated people. Nastier bits are hinted at, but I didn’t want to delve into them in this story. DM: Do you believe humanity is basically predatory, capable of altruism only when it doesn’t really cost us; or is humanity basically altruistic, capable of predation only when we’re frightened, desperate or in thrall to demagogues; or is a humanity an eternal, self-replenishing chess game between our altruistic and predatory aspects? NS: I’m more sympathetic to the latter theory. But I don’t think it’s chess. I think it’s tic-tac-toe. Even the best of us have certain psychological mechanisms that can suddenly kick in and turn us into monsters. That to me is the basic message of events like the rise of Nazism, the Salem witch trials, and so on: not that bad people do bad things, but that good people do bad things. It’s distressingly easy for those mechanisms to be triggered, either consciously by demagogues, or naively by people who think they’re trying to do the right thing. Which is why I think it’s more akin to tic-tac-toe. DM: As befits a novel whose title is a palindrome, your epilogue could almost be a prologue: we haven’t long met the Diggers (who will be reevaluating their hasty treaty with Red) and only just made contact with the Pingers; the mysterious Purpose has only just come up, and—unless I blinked—we never had hard evidence that the Martian-bound Arkies actually snuffed it (though, I admit, the odds would be stacked against them). Are you considering a “longer game” with a Part 2? (“MADAM I’M ADAM”?) New Earth is so rich: I didn’t want to leave it behind, yet. NS: What writers of fantasy, science fiction, and much historical fiction do for a living is different from what writers of so-called literary or other kinds of fiction do. The name of the game in F/SF/HF is creating fictional worlds and then telling particular stories set in those worlds. If you’re doing it right, then the reader, coming to the end of the story, will say, “Hey, wait a minute, there are so many other stories that could be told in this universe!” And that’s how we get the sprawling, coherent fictional universes that fandom is all about. I won’t belabor that, since it’s now the basis of most of the entertainment industry. I’ll just point out that Seveneves is squarely in that camp, and so it is inevitable that readers coming to the end of the book will react as you did. Making the book a hundred or a thousand pages longer wouldn’t change that. There is clearly the potential for more books, stories, or media adaptations. Whether or not those will ever exist is a function of financing, timing, and many other imponderables. As you’ll understand, having been through the entire process of film adaptation, marshalling all of the resources needed to produce such things is ludicrously complex and frequently ends in frustration. Your proposed title is excellent, though, and gives me something to work with! DM: I could easily ask you another six questions, Neal, but I’ll leave you in peace now. Thanks for considering my questions, and good luck with Seveneves. NS: And thank you, David. Good luck this fall with Slade House. While I completely appreciate the technical details provided in this novel, they tend to overshadow the characters to a degree that you have a hard time caring about any of them too much. It won awards apparently, but I found large sections of the book to be a chore to read. Conversations are interrupted by two pages of background information that makes you forget about what the characters were even talking about to begin with. What you end up with a giant patchwork quilt of a book with each square being very interesting and appealing and but when you step back and look at as a whole it makes an ugly mess where the pieces do not compliment each other. Some pieces work well, but other parts are just painful to look at. I think that this may have worked better as a trilogy and then each part could have been reworked and fleshed out properly and then the parts that are a slog would not be so painful if the people in the story were better developed and given enough depth so that you might actually care if they survive. Another thing that he does that really annoyed me was that he tends to skip over details of action scenes and rush to the next part without fully describing it. Most of the action takes place outside of the perspective character's view and you're finding out after what happened. I found that to be really lazy actually. I can't totally recommend this book, but if you can overlook its shortcomings you might find the 800+ pages worth your time. After reading a while, the simple Spielberg type sci-fi vanished, replaced by the odd feeling that Leonardo da Vinci had teamed with Jules Vernes to tell me a story. I was amazed by the profusion of inventions and explanations about life in orbit, fascinated by this story completely plausible with actual technology. A story that goes very far from the classical unities of action, time and place, as all first characters die in this 5000 years saga. There are unities, at the geological, cosmic and species scale, but not at the characters’ scale. Sketched sociological speculations, even if they go into unchartered territory, can’t replace the continuity of loving and suffering characters in the mind of most readers. Would it have been possible to add psychological studies as meticulous as the physical studies of orbit dynamics, repeated on consecutive characters, recognizable mind structures slowly evolving through centuries, to create that continuity? Not an easy task, but already sketched in the third part. 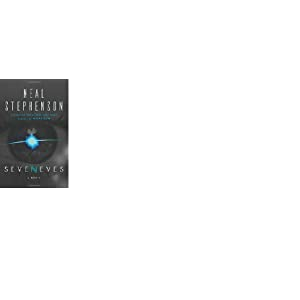 I would be really glad if one day Amazon told me that Seveneves has been updated, or that a new version spans seven books, I would read it again. Excellent and accurate descriptions of the limitations and properties of orbital mechanics. Very nice way of tying the current trend of private entrepreneurs getting into the space race (like Blue Origin and SpaceX) with the Ymir story. I could see Elon Musk doing something like that. :-) Very good perspective on human interaction in close quarters and the importance of human personalities on how it affects outcomes. Very cool uses of miniature robots in swarms and chains. Very interesting to discover the physics of chains and whips - I didn't know it was an area of study. Very skilled writing in tying it all together into a a tense, suspenseful adventure. 2.0 out of 5 starsFantastic Part 1/Horrible Part 3. Oh boy... So hard to review this book. It has 3 parts which I will address separately. The first part is amazing. Cool unique concept that's grounded in reality. Hard Sci-Fi if you will. Great for fans of The Martian (lots of problem-solving). The second is the core of the story. This part is initially interesting but characters that were developed and intelligent slowly regress to a 2-dimensional state in order to allow some ham-fisted drama to take place. The idea of the core is good but it feels like the writer simply couldn't get to it with the characters he had created in part 1 so he just gave up and reverted to archetypes and cartoon-like clichés. This one becomes hokey drama Sci-Fi, à la Star Wars (which is fine in other books but here it seriously clashes with part 1 and doesn't work). The third part is... well... no other way to say this; Fantasy Sci-Fi. Reminiscent of bad video games and children's TV shows of the 80s and 90s... It's just bad. Infantile. Immature. Poorly written and even worse with its telegraphed and common plot. Although this is the first piece of media from this universe, it feels like a child grew up liking a TV meant to sell toys and 20 years later decided to write fan-fiction for it. Along the way he accidentally writes a brilliant passage about how OUR world became this silly cartoon world but make no mistake: you're being sold a universe with a clear «PLEASE LIKE THIS AND DEMAND MORE BECAUSE I WANT TO WRITE MORE EPISODES OF THIS SILLY SHOW» sign over it. Read part one and burn the book afterwards. I think this may be Neal Stephenson's best book ever, and I go with him all the way back to Snow Crash and beyond. It begins with the moon being blown up. No spoiler here, as this is disclosed in the first sentence. What happens after the moon is blown up is the subject of a large book that phases effortlessly through periods of hard scifi exposition, fast action melodrama, thoughtful futuristic speculation, and always, always, original and awesome character drawing, human psychology, and non stop narrative invention. I cant overstate how much I admire Stephenson. Please God let it not be seven years until the next big one.